American Girl Publishing Inc, 9781609588694, 192pp. "My name is Felicity Merriman," says a girl your age. Instead of shorts or jeans, she's wearing a long blue gown. "Have you just arrived in the city?" She must be one of the junior interpreters, you think. She's really good, like an actor. You decide to play along. "It seems so." Felicity nods. "Many have arrived since the royal governor schemed to steal the colonists' gunpowder in the dark of night. Patriots have been streaming into Williamsburg like a river in flood "
What if you suddenly found yourself in Felicity's world during the American Revolution ? 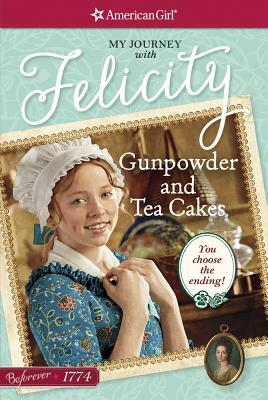 Together, you and Felicity could hang out at her father's store, sip tea at the Governor's Place--or get caught up in a gunpowder plot As you read, you decide what happens next by choosing your own path through this multiple-ending story.